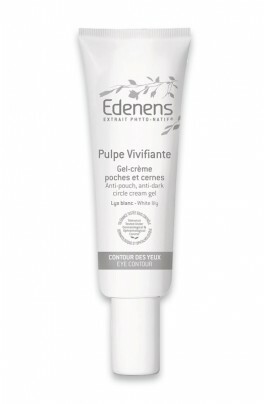 Edenens Eye Contour Cream-Gel Pulpe Vivifiante is a real moisturizing* energizing cocktail that lights up the eyes by fighting dark circles and puffiness. White Lily boost micro-circulation to revitalize eye contour area while protecting it from outdoor damages. Combining the freshness of a gel and the softness of a cream, its nice texture is easily absorbed. 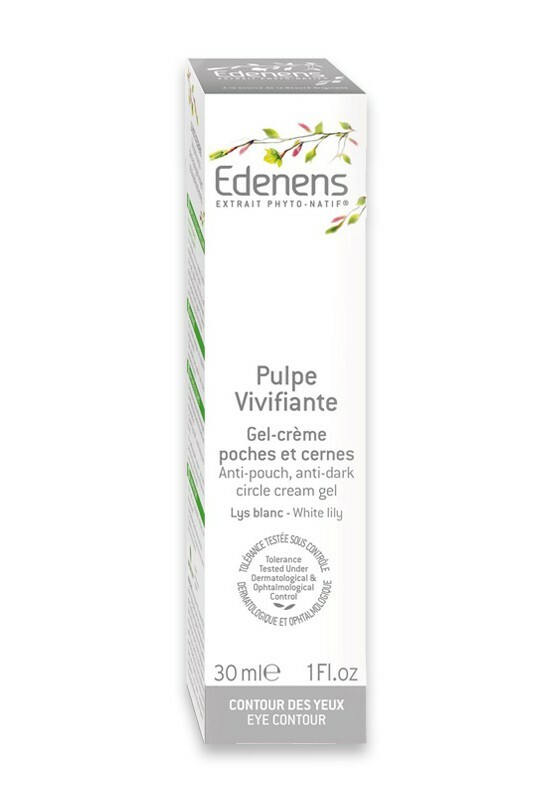 Edenens Eye Contour Cream-Gel Pulpe Vivifiante contains subtle twinkling powders that catch the light to smooth and even the skin. Skin tolerance tested under dermatologist control. Apply Edenens Eye Contour Cream-Gel Pulpe Vivifiante day and night to the eye contour area, tapping gently from the inner corner going outwards. Aqua, Methylpropanediol, Sodium Polyacrylate, Biosaccharide Gum-4, Glyceryl Undecylenate, Sorbitol, Glycerin, Caprylyl/Capryl Glucoside, Pfaffia Paniculata Root Extract, Ptychopetalum Olacoides Bark/Stem Extract, Lilium Candidum Flower Extract, Hesperidin Methyl Chalcone, Steareth-20, Dipeptide-2, Palmitoyl Tetrapeptide-7, Hydrolyzed Soy Protein, Fagus Sylvatica Bud Extract, Onopordum Acanthium Flower/Leaf/Stem Extract, Alcohol, Alumina, Titanium Dioxide, Benzyl Alcohol, Dehydroacetic Acid, Sodium Dehydroacetate, Phenoxyethanol, Potassium Sorbate, Chlorhexidine Digluconate, Benzoic Acid, Sodium Citrate, Citric Acid.